When I went vegan, I thought grilled cheese was out of my reach. Of course I could use one of the commercially made vegan cheeses on the market, but I don’t think their ingredients are ideal. So I was left to create a vegan grilled cheese from whole food ingredients. We have been using our dairy free cheese sauce in many recipes lately, so I thought I would test it out by making this vegan grilled cheese. 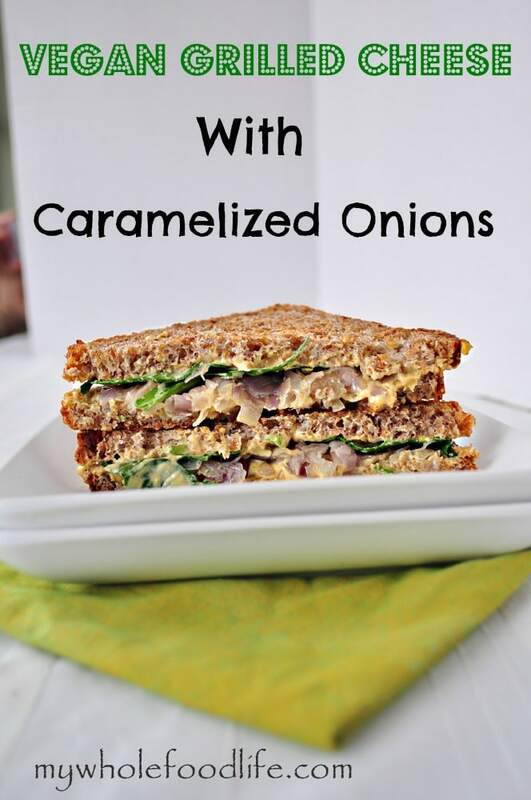 It’s not only good, but the caramelized onions boost it into awesomeness. The only downside to this vegan grilled cheese is that they need to be made to order. However, the onions and the cheese sauce can be made ahead of time. You will just need to assemble the sandwich right before you choose to eat it. These vegan grilled cheese sandwiches were so good, I am already thinking of all the variations I could come up with. Now vegans can enjoy this classic sandwich as well! In a saucepan, on medium low heat, saute the onions in oil and salt. Cover and continue to saute until the onions break down. Once the onions are caramelized, assemble the sandwiches. 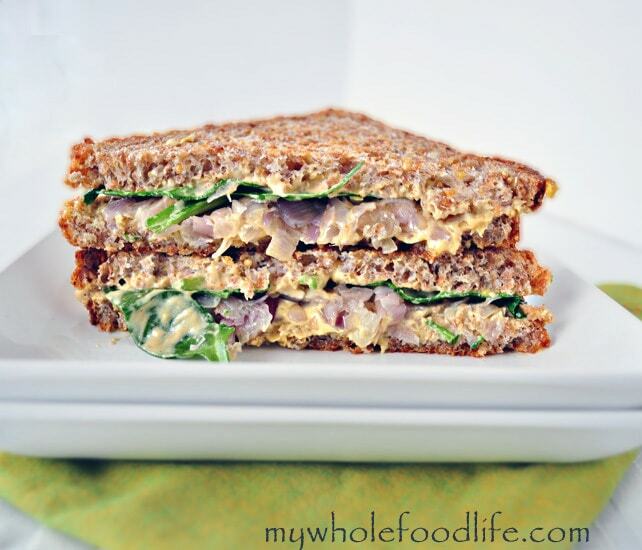 For each sandwich add 2 slices of bread, 2 T cashew cheese sauce and 5 leaves of baby spinach. In a saucepan, grill each sandwich in a little coconut oil until both sides are browned. If you want to make this gluten free, just use your favorite gluten free bread. Thank you! I am not a big fan of sandwiches either, but I ate two of these at once today. They were very good. This looks wonderful, as always with you! I think grilled cheese are best made to order anyway! I would love to give this a try very soon! Thanks for the great recipe! Thanks Tina! I hope you enjoy it. A lot of people take Juice Plus. If you google it, you should be able to find out more. It's a food based supplement. Thanks for sharing this delicious recipe, and especially the cashew cheese sauce! I have been searching for something like this. You are so welcome! It has taken several tries to get that sauce right. It sounds good...but I'm allergic to nuts. So what could I use as a substitute?? You might be able to use white beans? I haven't tried, but that is an idea. I LOVE the sound of this!! I never thought to use cashew cheese sauce on a grilled cheese - perfect! Pinned and SO excited to try :) Thank you! I was so happy when I clicked on this to see that it wasn't processed vegan cheese (which I'll eat but just don't love!) I'm always at a loss for vegan sandwiches and can't wait to make this one ! Yay! I agree with you on the vegan cheese. We use this cheese sauce for everything. :) I hope you enjoy the recipe. Melissa, I made this tonight and it was AMAZING! I really didn't think anyone would be a fan of the cashew cheese sauce but it was a total hit :D Some of us prefer Miracle Whip while others prefer regular mayo, so I did use them (I've given up a lot of processed stuff but M.W. and mayo ain't one of them) but I think it just added to the awesomeness. I had some tomato soup ready for dipping...soooo goooood!! Definitely making them again, thank you! Made this tonight. Fabulous!! I used veggie broth instead of oil to saute the onions. Can use a nonstick skillet to grill the sandwich in order to avoid the oil :) Will definitely make again! !